Today is Mother’s Day. My grandmother used to say that every day should be Mother’s Day. And, the truth is that when my mom was alive, every day WAS Mother’s Day. We were so close that we did not need an actual holiday to celebrate that fact. 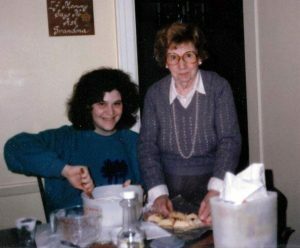 Living in a house with Grandma, I feel like I grew up with two mothers, and I would like to honor them today. People often described Mommy and me as being attached at the hip. My dad always said that he loved to listen to us giggle. She was a child at heart and I get that spirit from her. She loved Mickey Mouse and Paddington Bear and she loved children. Children loved her, too. She was a teacher at our local early childhood school and she loved when kids would greet her when we were out shopping. People laughed that we spoke on the phone many times every single day. We went to the theater and ballet together. Our excursions to NYC from Long Island for the holiday windows and the after-Christmas sales were epic, strategically choreographed events. We loved each other unconditionally and had so much fun. Frankly, I could not imagine living after she died. Grandma and I were also very close. From the time I was a child, I was in awe of Grandma and her elegance. I loved her sense of fashion. She had a wonderful way of putting together colors and fabrics and styles. The best shopping I ever did was in her closets and drawers. In fact, I still have some of her clothing and jewelry. More than once, sales people at stores would approach me and ask, “are you the person who called your grandmother for fashion advice?” They found that admirable. If they knew her, they would have called her, too! When I’m feeling lazy about dressing up or putting on make-up- it happens rarely, but it happens!- I hear her warning me that I never know who I am going to meet and I should always look my best. Clearly, she was hoping for a nice, Jewish Prince Charming. My fairytale was not quite exactly her idea of the “tale as old as time,” but Grandma always seemed to understand that I danced to my own beat. Sometimes we frustrated each other, particularly when I challenged her ideas of an ideal life. At times, it was also difficult for me to feel that I had two moms telling me what to do, and that my mom seemed to have a supervisor. 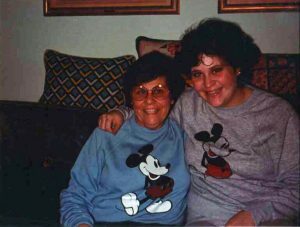 But, Grandma and I had a special bond and an unconditional love for each other. Grandma had four brothers and a sister, my great-aunts and great-uncles, and I loved them all dearly. Losing Grandma and my older relatives left a huge void in my life. However, through our loving relationships, I developed a tremendous appreciation of and compassion for elderly people that I have to this day. 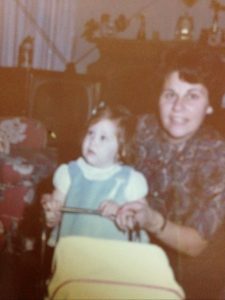 My mom was at her core a natural, nurturing caregiver, at a time when there was no real acknowledgment of the role of caregivers. 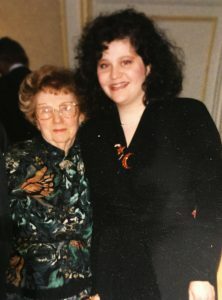 She took care of my dad, brother, our dogs and me, as well as Grandma, but was also responsible for looking after my great-grandparents, great-aunts and great-uncles, and even my cousins. She even knew the treats that my friends liked and made sure to have them on hand at all times. She took care of everyone in myriad ways. My mom was the most selfless person I have ever known. 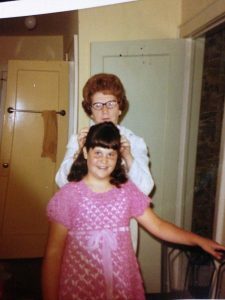 In many ways, my own caregiving days started when my mom died. I followed her example and began looking after Grandma, my dad, my great-aunt who was in a nearby nursing home. I was constantly on the phone with Grandma and my dad and helping them tend to various chores. I also loved and kept in close touch with my great-aunts and great-uncles. I went home every weekend to help in any way I could, and sometimes that was simply keeping everyone company and making them laugh. My grandma did not want to be cheered, and I understood that. I don’t think that anyone fully comprehends the loss of a child unless they experience it. My aunt, my mom’s older sister, also visited every weekend. But, after a sudden death, everyone floundered and tried to pick up pieces while still in shock and feeling profound sadness at the loss of the key person in our family. And, as in any family, the dynamics led to tensions that were, at times, explosive. I found that, just like I believe my mom would have done, I spent my time with them being a cheerleader and my private time at home collapsing in grief. Sometimes I came home, sat on the sofa and cried, and at other times I dropped my bags and took myself to a movie just to escape. When I was the sole caregiver both for Ben and my dad, I often thought about how hard my mom worked, and that served as a tremendous inspiration. Ben admired the closeness and devotion that we had. He saw it in my relationship with Daddy and felt it as I shared stories, rituals and memorabilia with him. 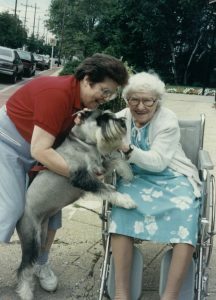 As time has passed, I recall many wonderful memories of my mom and Grandma and our time together. So much of who I am and what I do reminds me of them. I get my Peter Pan-like inner child spirit and love of Disney from my mom. 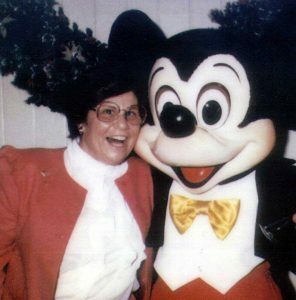 You won’t be surprised that one of my favorite memories is when my mom called me from Walt Disney World exclaiming, “Abby, I met Mickey!” Every time I bake I feel Grandma with me, and she is a part of all of my creative and artistic endeavors, as well as my fashion choices.